A GFRC (glass fiber reinforced concrete) chimney cap from Stromberg will crown the top of your chimney in style. Why use a chimney cap? A chimney cap protects your chimney and flue from the onslaught of animals and Mother Nature. Small animals like birds and squirrels can do an enormous amount of damage; they may build nests inside your chimney, blocking the flue and causing a dangerous situation. Rain and hail can also cause significant damage if you don’t have a chimney cap. Stromberg has the largest selection of chimney caps you’ll find anywhere; they come in a wide range of designs, custom or standard. 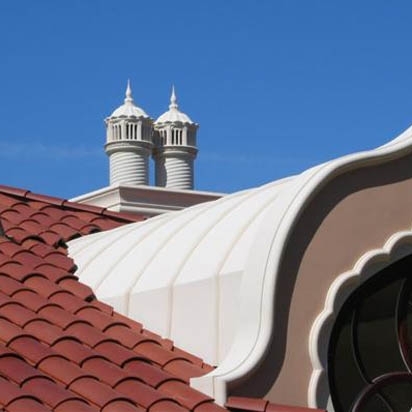 Textures like limestone, sandstone and coral stone are a few of the textures that Stromberg can use for your GFRC chimney cap. They’ll match it to the color of your chimney so that it fits right in and looks like it’s always been there. Stromberg will help you with CAD details, design assistance and all specifications for your GFRC chimney cap; they’ll invent or engineer a solution to make your project a success, no matter what the challenge. Don’t settle for an unattractive metal chimney cap when you can have the sophistication of Stromberg. Glass fiber reinforced concrete is the best material for your chimney cap; it’s reinforced with glass fibers instead of steel, making it lightweight and very easy to install. Because of this lightweight quality, GFRC chimney caps will cost you less in shipping too. As a noncombustible product, these chimney caps add to the overall safety of your home or business. Stromberg has pioneered the use of GFRC and they’ve engineered it not to rust, crack or corrode; you can count on your chimney cap to last for generations to come. GFRC won’t rust, so a protective covering of concrete isn’t needed. GFRC is cast in molds so your chimney cap can have almost any design. Glass fiber reinforced concrete is made of minerals and won’t burn. GFRC is light, but strong and very durable. The artisans at Stromberg Architectural Products will help you transform your GFRC chimney cap vision into a reality. Stromberg is here to help, and they can solve any kind of design challenge. Contact them today at (903) 454-0904 for your free custom quote and put their 30 years of experience to work for you.